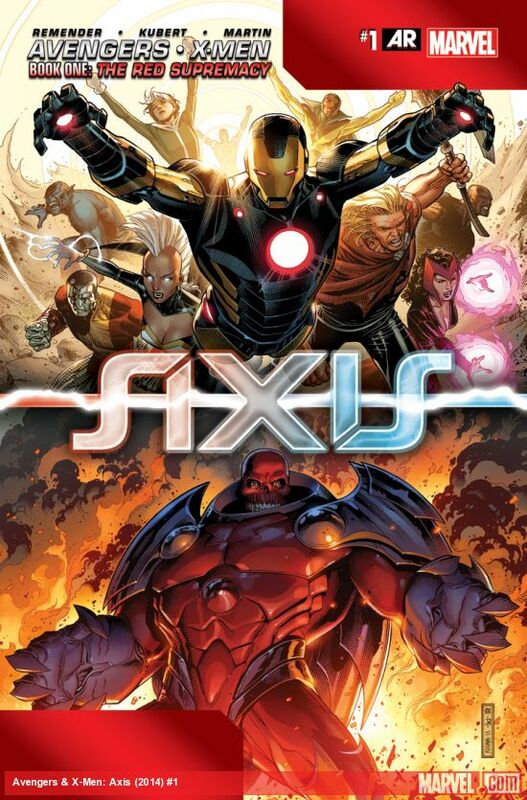 I just got finished reading the conclusion to the main story line for Axis in the Marvel Comics Universe (MCU). I LOVED it. A lot of you will probably think, “Well, of course she did. Tori always loves Marvel.” Well…that isn’t wrong, but universe events are hit or miss, really. The two before Original Sin, Infinity and Age of Ultron, were misses for me. (Which is why I made the mistake of skipping Original Sin.) After those two, I had kind of fallen off of the cross-over events since they are often a bit of a let down and have less effect on MCU than I think that they should. Axis seems to be different, though. The final fallout from the event is still to be seen, but it sounds really promising. I will leave the spoilers until the end of the review, but know they are great. As for non-spoiler details, the premise of the story is that Red Skull stole part of Charles Xavier’s brain to become a powerful psychic and sent out a psychic wave of hate over the planet. To fight this, the heroes/villains combined chaos and order magics to invert the Red Skull and hopefully bring out the dormant/subverted kernel of Xavier. It worked, but a bit too well and inverted everyone there. Reading about the inverted heroes and villains was a lot of fun in all of the books. I did not really branch out into other comics than the ones I normally get, but it was a hell of a lot of fun. There were a couple of continuity errors between books that were just me having a blast being nit picky (Thor sometimes has a beard and sometimes does not). The exploration of the characters as they are inverted and getting that look at who they are by their contrast was really interesting. I kind of wished it had gone on longer to explore this more, though. I feel like these stories have a lot of potential to be really interesting, but it would have been bad to drag out that storyline. Obviously, I needed the one with Nightcrawler. 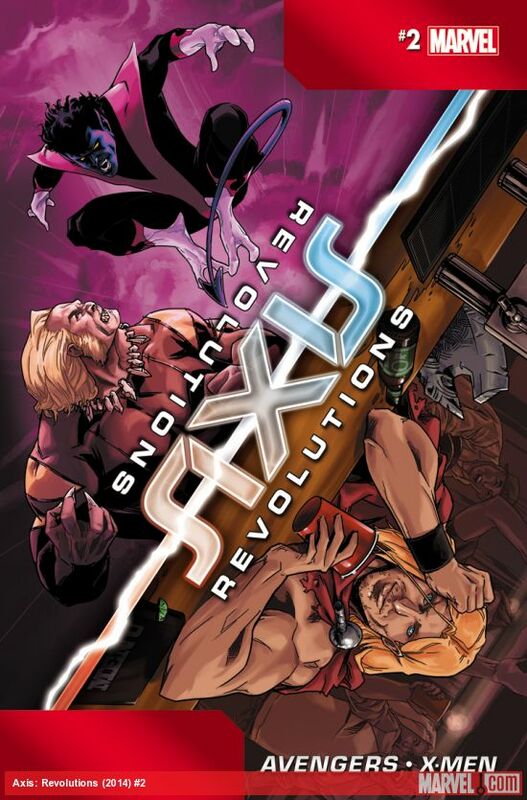 The Axis: Revolutions books, telling in-continuity stories of the inverted heroes/villains, got to do a bit of this. Unfortunately, those appear to be finished after only four issues. I am really hoping they decide to do some more, though, like they did with the run of A+X. Both of those were some really fun short stories, even if A+X was not really in continuity. I do not know how well either of these mini-series sold, but I know I would buy any more of either that they decide to publish. The Axis ones are all the fun of What If stories with all the world changing consequences! Before we get to the spoilers, I want to say that I definitely recommend this series with a strong caveat. It is not something I would recommend for people not familiar with the characters, though. A lot of the story is based heavily on this exploration of the identities and if you do not know who they are before the inversion, the inversion will not mean much to you. Once you get to know the characters a bit, though, swing back to this one (You could do Civil War and then Axis and probably have a great time). Those who were familiar with the characters in the past from comics or cartoons might be ok, though. This probably is not a terrible jumping on point for that group. Current fans, though, should definitely read it. It is a lot of fun, action packed, good art (as far as I can tell) and a lot of good characters. Of course, the consequences from the inversion were not all they could be. The swapped heroes caused massive havoc and destruction, but the villains made a video saying they tricked everyone and did not want the heroes getting the credit. The X-Men will probably still get the shaft (they always do), but the Avengers should still be nice and shiny. I don’t read a lot of Avengers comics, but, while I like the idea of these massive consequences, I do not know how appealing it would be to read. I generally enjoy the internal struggle complications – the guilt, awkwardness, etc. – as opposed to needing to redeem themselves in the public eye. Before you ask, I know this sounds like all the consequences and changes can be easily swept under the rug. I doubt they will, since, especially the X-Men, love some interpersonal drama. But a lot of stuff was revealed on top of this (such as Magneto may not actually be Wanda and Pietro’s father) and not everyone was switched back, most notably Tony Stark (Iron Man), Victor Creed (Sabretooth) and Alex Summers (Havok) and even a death (Carnage) before he was returned to his villainous ways. Plus, there’s apparently going to be a rhinestone memorial statue of Carnage somewhere, so that’s pretty awesome?